Great seller! excellent ebayer! Loved this product! I love this egg!!! It is so fun to watch it change colors! You can also stop it on any color!! I am in my 30's and I purchased this for myself and I love it!! I find it very therapeutic and calming. When my anxiety is high I turn off the lights and turn on this egg and it seems to settle my nerves. I do not know if it is durable or not, I said it is not because it is plastic though I haven't dropped it or anything so I honestly don't know. 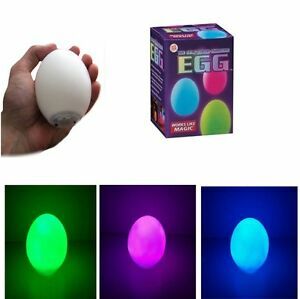 I can see this being great fun for kids, a eggcelent easter present ;-) or used for therapy... a great all around little light up egg! Also I could see a row or rows of these lined up on a walkway or as center pieces on tables.. honestly they can be used in so many different ways either set on a solid color or slowly changing color. Great gift, great party display, great therapy toy/tool... just great fun!! Just as pictured. My little one loves it. It's just as pictured. It's bigger then I though which is awesome. Thanks for such a great item!